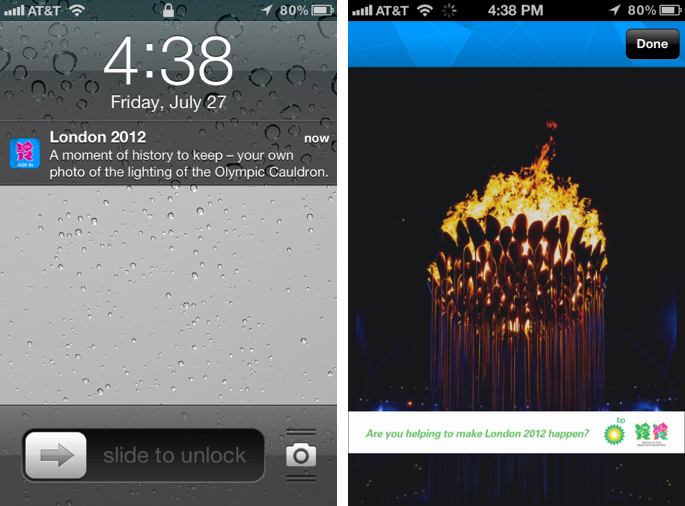 The Official London 2012 Join In app, created by Xomo Digital for The London Organising Committee of the Olympic Games and Paralympic Games, offered an essential planning tool for attendees. Full event listings, a personal schedule and alerts feature, searchable maps and the ability to share a location pin with friends, offered a comprehensive mobile guide to plan, enjoy and share experiences. Recently, Alex Balfour, head of new media for London 2012, shared statistics demonstrating how this was the first truly mobile Games with 60% of online visits coming from mobile devices. The app utilized Urban Airship Location Messaging to send more than 10 million location-based push messages to people in the stadium and other Olympic venues, including ceremony photos, spectator surveys and information. Nearly 60% of app users had location-sharing enabled and location-based pushes achieved clickthrough rates of around 60%.